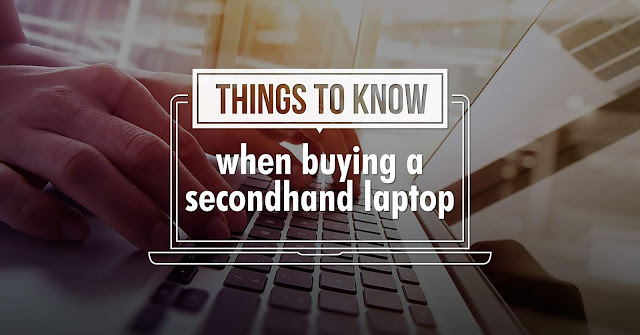 Buying a used laptop is a smart and practical move, especially when you want to save a little cash but still get a good deal. With so many used laptops being sold online, however, knowing which one to choose can be quite daunting. Trim down your choices by identifying your specifications. Are you looking for a laptop that’s good for basic use like sending emails, web surfing, basic office functions, and picture sharing? Or will you be using it for intermediate applications like basic creative software and advanced office duties? Another possible use is for advanced functions like gaming, web hosting, or music/photo/video editing. Knowing what you will be using it for will help lead you to the best used laptop suited for your needs. Before making your purchase, make sure to read user reviews on different laptop brands and models. See what people are saying about brand performance over time. It also pays to do a background check on the sellers to make sure that they have a good history in the community. Before purchasing a used laptop, make sure to compare the secondhand price with the brand-new price. You can start off your price survey on OLX, which has an extensive amount of listings of both brand-new and pre-owned laptops. Knowing and comparing the prices will help you make an informed decision whether you’re better off buying a used laptop or a brand-new one. Once you have made a shortlist of possible laptop units you want to buy, check the inclusions that the seller will be providing aside from just the unit. Make sure all the pertinent details of the laptop are made available to you. This includes the original software CD, recovery CD, drivers, backup media, and licenses of the software. Very important: Be sure to check if the preloading operating system is genuine. Ask the seller if it is possible to check the motherboard to test how responsive and fast the laptop is. Observe if it heats up fast or makes loud noises when you start it up. Many buyers wish to purchase used laptops that look brand-new and spotless. If the external appearance matter to you, you might want to check if there are any dents or cracks because these might lead to bigger problems for the used laptop in the long run. Check the condition of the screen. It’s not worth the purchase if the screen flickers or has uneven brightness because it could mean there are loose connections that cannot be repaired. The great thing about laptops is that they can be used even when unplugged. Thus, its battery life is important. Most laptop batteries have a lifespan of three years, so if it’s a used laptop, it’s possible that its battery will have a limited standby time. Be sure to check this before making your purchase. Try out all the ports, headphone plugs, HDMI, SD card slots, CD/DVD drive, and other inputs, which are essential for an easy file transfer or other recreational purposes. These are attached to the motherboard and may get costly to replace. The value of a used laptop decreases if it can’t connect to WIFI. Before buying, make sure that it can connect to WIFI networks without hassle. Search for the best secondhand laptop for your needs only at https://www.olx.ph/.